The Hip-Hop Dalmatians Are the Greatest Rap Group That Never Was. Probably. Maybe. As far as late-’90s and early-2000s black cinema goes, Brown Sugar is probably my favorite movie. The Wood is as close a second as you can get, much in the way thatReasonable Doubt is my favorite Jay Z album but I can listen to The Blueprint all day every day. In fact, The Wood is a movie I loved so much that I was actually sad when it ended and wished for another 15 to 30 minutes of movie. Of course, that could be because I had the pleasure of watching it with the black community at Magic Johnson’s theater in Atlanta’s Greenbriar neighborhood, which means that the experience was just as entertaining as the movie. But back to Brown Sugar: I realize that Love & Basketball is probably a better movie and that they are forever linked because L&B came first and Brown Sugar is pretty much the same movie except with hip-hop instead of basketballs, and it similarly included Sanaa Lathan as the main love interest. For those reasons, I can understand why Brown Sugar isn’t universally lauded the same way. But it was funnier (Love & Basketball wasn’t really that funny at all), Mos Def was tremendously hilarious, Taye Diggs was super corny and wore leather pants in the early 2000s in a movie about hip-hop, and Lathan was Sid Shaw, a music journalist who took over XXL magazine and was writing a hip-hop memoir of sorts, so it scored beaucoup points for personal relatability. The fact that Brown Sugar came out in 2002 and I didn’t start blogging until 2004 is also a moot point, considering that R. Kelly said he came up with the remix to “Ignition” before the original song. The man created a remix to a song that didn’t actually exist yet. Brown Sugar had love and it had hip-hop at the same damn time. It had New York City and the tension between selling out and “keeping it real.” It had the super-funny scene where Andre Romulus Ellis (Diggs) rolled up on his wife, played by Nicole Ari Parker, at the restaurant while she was out on a date with Richard Lawson (he sounded educated) and told the waiter that they were going to celebrate their divorce with an expensive bottle of champagne. We had rapping ball players (in the vein of Allen Iverson or Kobe Bryant) in Boris Kodjoe's Kelby Dawson. The movie had everything. It even had a ridiculous definition of “brown sugar,” for which the movie was named. It had Blackalicious songs playing throughout the movie—effectively, theBlazing Arrow album was the soundtrack (Blackalicious have long been one of my favorite rap groups, and they are the group that owns my favorite rap-group name of all time), with a few Kanye West-produced songs sprinkled throughout. It had Kanye West production! And most important, it had the Hip-Hop Dalmatians. If ever there was a rap group whose album I wanted to hear, it was them. 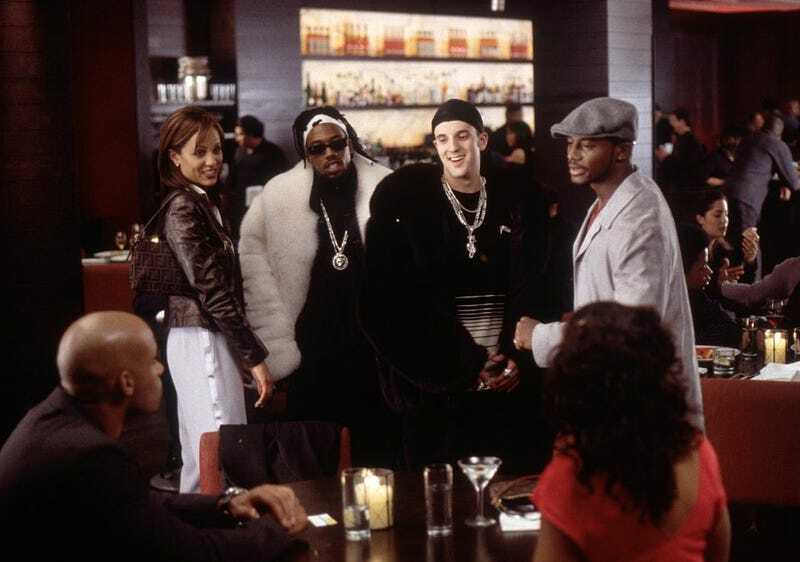 They were Ren and Ten, a black-white rap group who weren’t sure who was named who, but they wore Dalmatian-looking furs and black-and-white clothes to illustrate that they were representing that whole unity thing. Because black and white. They take you one place, then they “go 160 degrees to the other side” and do something different! The Dalmatians were the type of group who took their nonsense seriously. Not once did they think they weren’t going to be the next best thing or were a novelty. No, they were “the real deal, Sid!” They brought something to the table, and nobody could tell them otherwise. They were every one-off rap group that ever existed. They were Smilez and Southstar before Smilez and Southstar, who coincidentally dropped their one song worthy of note, “Tell Me,” in late 2002. While I think that “Tell Me” would have been too sophisticated for the Dalmatians, it ain’t far off from their modus operandi because you can’t tell me that Smilez and Southstar didn’t take themselves seriously even though anybody who saw their video knew we’d never hear from Orlando, Fla.’s finest again. But here’s why I believe in the Dalmatians and why I believe they would have ascended the ranks of hip-hop’s faux elite (at least until 2003, when 50 Cent changed the game back into gangsterisms for a spell): The little bit we heard would have been par for the course in the hip-hop landscape, except that they had a ridiculous gimmick, and that song was (potentially) fire! If they were any good on the mic­—which they probably weren’t, but neither was Silkk The Shocker, and look at his career—they could have been fun. And they would have hit right before hip-hop took itself too seriously with the death-and-demolition days. Keep in mind, Cam’ron was a thing during this time and he had computers 'putin as he told you to 'get 'em girl'. We don’t know if the Dalmatians could rap, so I’m willing to give them the benefit of the doubt. The Dalmatians could have been great because they were going to be fun on the way to the inevitable split due to creative differences, when one wanted to keep doing the standard-issue pop-rap stuff and the other gained a knowledge of self and wanted to make music that better reflected his newfound understanding of humanity. Mostly, though, they had a real hit on their hands that I was pissed about never getting to see released on the soundtrack. Ren and Ten might have been trash. But in 2002, they were the kind of trash you’d see in a Hoarders episode in 2011. To the Hip-Hop Dalmatians, I salute you.